Try this sophisticated French twist on an apple pie and wow your guests at a dinner party! The tarte is baked in a skillet and turned out fresh from the oven onto a platter and voilà, dessert is served. 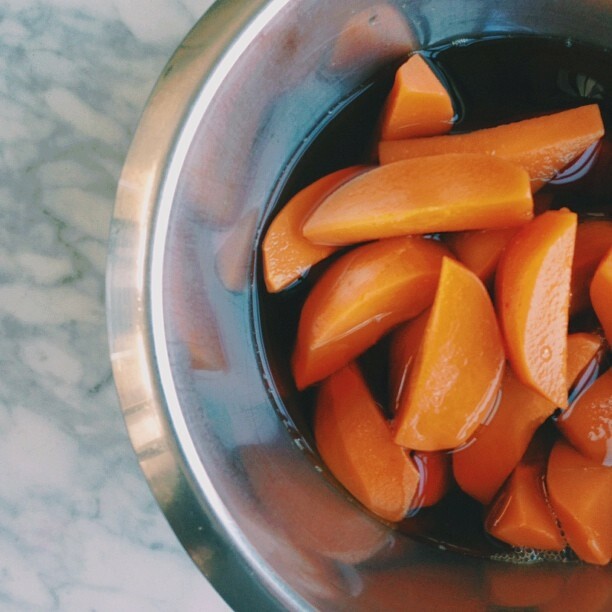 This fun recipe is courtesy of our very own Mission Community Market vendor Marla Bakery. If you’ve tried the hand pies they sell at the market you know how wonderfully flaky the crust is. 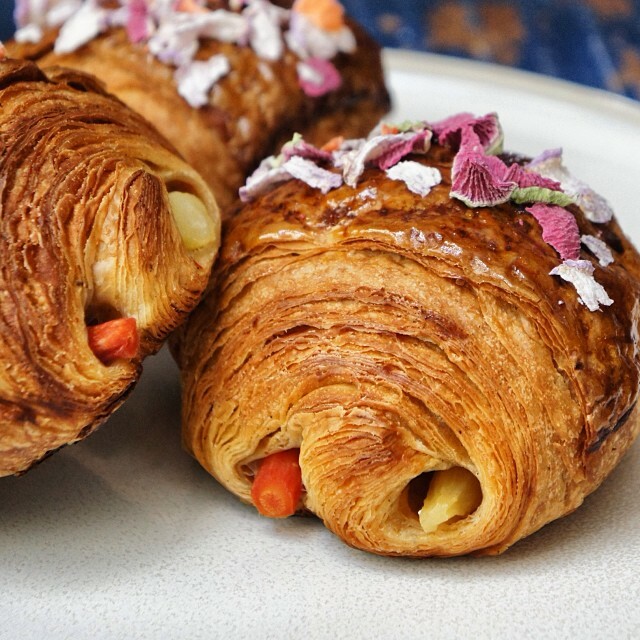 Here is your chance to try your hand at that flaky goodness yourself using their recipe! 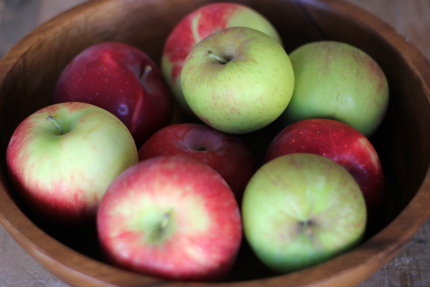 Visit Hale’s Apple Farm at the market to find a delicious variety of seasonal apples organized from sweet to tart. 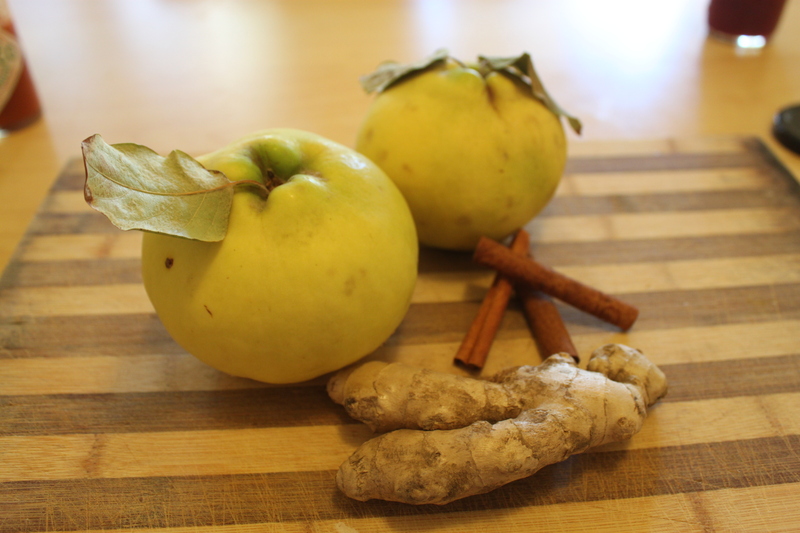 They recommend baking with a variety of apples – we used Sleeping Beauties and Romes! Happy baking! Mix salt and flour together. Pour out onto a table and cut in cold butter, until very small pea sized chunks. Mix the ice water and bourbon together. Pour over dry mixture and work in with a bench scraper or pastry cutter. Try not to use your hands, this will warm the butter. 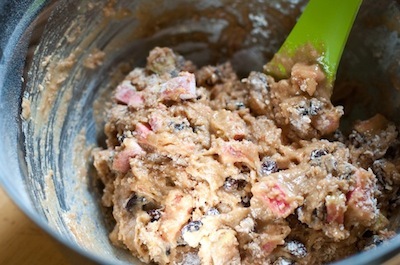 Mixture will be very dry and crumbly, fold and press until you have a shaggy, cohesive mass. Wrap in parchment and chill at least 6 hours. 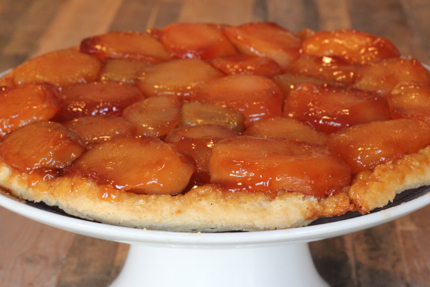 To make the Tarte Tatin, roll out dough to a rough circle about 1/4″ thick. 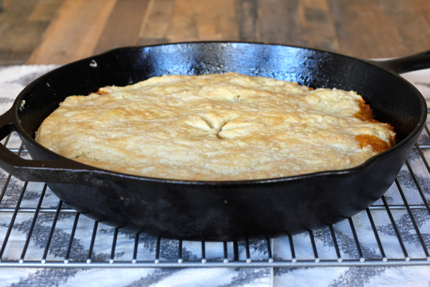 Take a cast iron skillet or saute pan and trace the circumference of the pan onto a piece of parchment. Cut this out and use as a guide to cut a circle in the dough. Mark the middle of the dough with four small cuts and chill dough round. 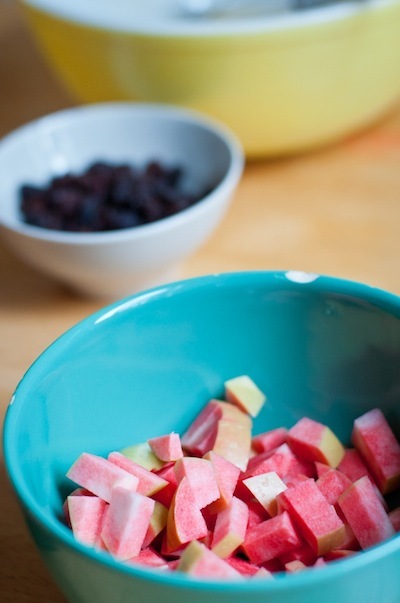 Meanwhile, peel apples and cut into quarters, slicing out the core. Mix apples, sugars, salt, and lemon juice and let sit until apples release their juice, about 20 mins. Strain apples and reserve juice. In your skillet or saute pan melt butter. and pour in sugar/apple juice mixture. Bring to a boil and stir until mixture begins to caramelize. When mixture is a golden brown color turn off heat and carefully place apples cut side up in pan. Don’t burn yourself! Apples should completely cover the bottom of the pan. Bring back to medium high flame and cook for 10 mins, covered with a lid to tenderize apples. Turn off heat, and carefully place your dough round on top of the apples and slide into the preheated oven for 25 to 30 mins. When done, pastry should be dark golden brown and you should see caramel bubbling around the sides of your pan. Pull out of the oven and let cool for 7 mins. 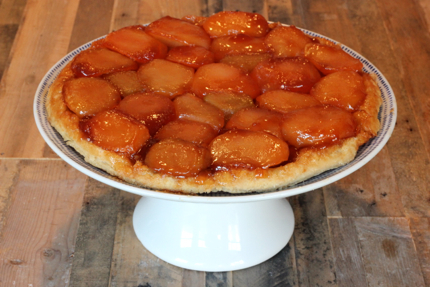 Carefully place a sheetpan or large plate over the top of the pan and quickly flip over to release your tarte tatin. If any apples are stuck to the pan, you can remove them with knife or spatula and place them on the pastry, no one will mind! 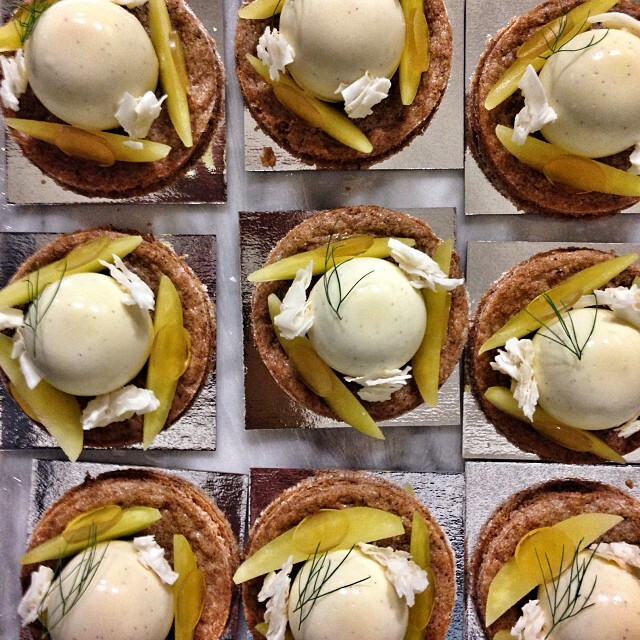 Cool to room temp and serve with sweetened creme fraiche, ice cream or whatever your heart may desire. Enjoy! Following the advice of farmer Dave from Hale’s Apple Farm, I used these beautiful pink pearls for this recipe as they not only offered a vibrant pop of color but also a unique flavor difference. 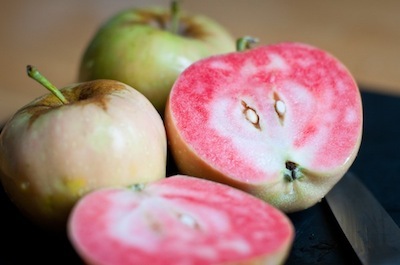 As pink pearl season has sadly ended, we’re confident that this recipe would be equally delicious with any of his apples – ask Dave what’s good this week and perhaps even use a mix of two or three of his varieties! Recipe found after the jump. Some notes before you start: Depending on the size of your muffin tin, this batch should produce about 12-15 muffins. I opted for using coconut oil to grease my muffin tin instead of paper liners but you can use the method that best serves you. The batter won’t expand too much when baking, so don’t be afraid to add a little extra to each cup if you want a nice shapely muffin top. Lastly, we kept nuts out of this batch but if you want to add a little meaty crunch, go ahead and throw in a half cup of chopped walnuts when adding the apple chunks and raisins. Apple Season is Here at MCM! Last week marked the official start of Apple Season at MCM. 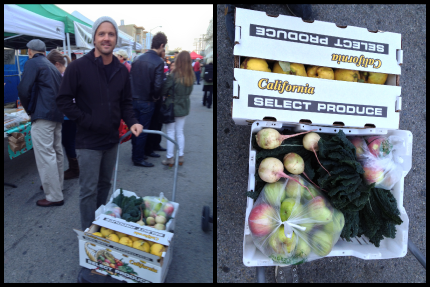 Our favorite Sebastapol apple farmer, Dave Hale, brought with him the first crops of the season, and they did not disappoint. Pink Pearls pictured below from Hale Farm are a customer favorite for their unique pink flesh that rivals watermelons in brightness and color. Hale Farm grows over 30 varieties of apples, including Gravensteins, which they also have at MCM right now. These delicious apples are native to Sebastapol, a little bit tart, and perfect for pies. 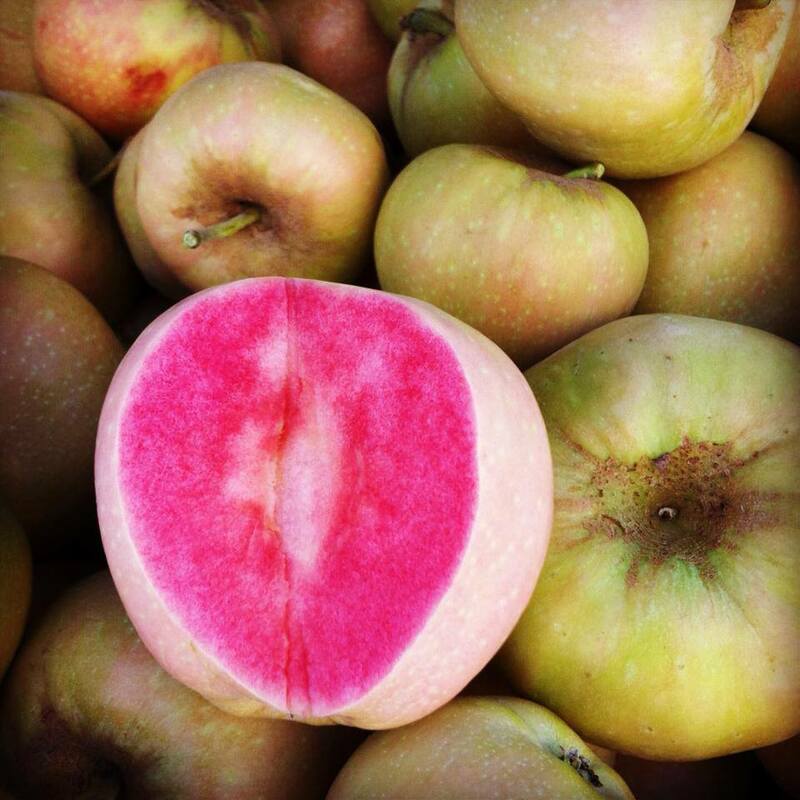 This week, Delta-based Zuckerman’s Farm will also have their first crop of Gala Apples which we can’t wait to try! Come on down to MCM this week and have a taste of these varieties of apples, and get excited for the bounty that is yet to come this autumn.